Nearly five years ago, the former CEO of Barclays Bank, Bob Diamond, defended himself against accusations that on his watch, Barclays had deliberately falsified Libor submissions. To no avail: after widespread adverse press coverage, Diamond resigned. Was this at the instigation of the Governor of the Bank of England and the head of the FSA? We will probably never know. But events yesterday make not only Diamond's resignation, but also the prosecution and jailing of traders and Libor submitters from Barclays and other banks, look distinctly odd. In the recording, a senior Barclays manager, Mark Dearlove, instructs Libor submitter Peter Johnson, to lower his Libor rates. He tells him: "The bottom line is you're going to absolutely hate this... but we've had some very serious pressure from the UK government and the Bank of England about pushing our Libors lower." Mr Johnson objects, saying that this would mean breaking the rules for setting Libor, which required him to put in rates based only on the cost of borrowing cash. Mr Johnson says: "So I'll push them below a realistic level of where I think I can get money?" His boss Mr Dearlove replies: "The fact of the matter is we've got the Bank of England, all sorts of people involved in the whole thing... I am as reluctant as you are... these guys have just turned around and said just do it." Note the last sentence. At the time, this passed largely unremarked - but in the recording reported by the BBC, Mark Dearlove makes a similar comment. Someone very senior in the Treasury seems to have instigated the Bank of England's request for Libor lowballing. The identity of this individual has not been revealed, though the Telegraph thinks it knows. Libor manipulation is now a criminal offence - when it is done by banks or traders to boost their own profits. So the growing evidence that the Bank of England was manipulating Libor rates during the financial crisis at the behest of the Treasury raises some very serious questions. Firstly, why would the Bank and the Treasury have wanted to manipulate Libor? It seems highly unlikely that this "lowballing" request, made during the worst financial crisis since the 1930s, would have had anything to do with flattering bank profits. So what might it have been about? Well, at this time banks were dropping like ninepins. Several Libor panel banks, including RBS and HBOS, were already shut out of markets: their Libor submissions in no way reflected the real cost of market funding for them (which was effectively infinite). And market rates were heading for the moon, as suspicious market participants looked for the next domino to fall. It seems entirely reasonable to me that the Bank of England, prompted by a worried Treasury, would have tried to lower Libor to something more sensible than panicky banks would charge to lend to other banks they feared could collapse at any second. 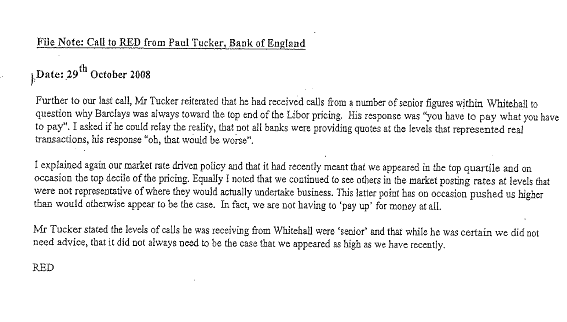 Secondly, the note from Tucker shows that Barclays's Libor submissions were among the highest at that time. Normally, high funding costs indicate that the market thinks the bank is a poor risk: for example, Northern Rock's funding costs rose dramatically in the months before its collapse. So Barclays submitting higher Libors than other banks could have signalled to the market that it was next in line for a bailout. Did the Bank of England - or the Treasury - know Barclays was in trouble? Or did they merely suspect it was? Either way, did they pressure Barclays to reduce Libor submissions in order to ward off a market attack on a bank perceived as vulnerable, thus buying time for Barclays to find additional funds to beef up its dwindling equity? This raises further questions about Barclays' behaviour. If Barclays was the source of the new recording, why wasn't it released five years ago along with the Tucker file note? Why has Barclays been sitting on this evidence? Why did Bob Diamond take the fall for Libor manipulation that appears to have been instigated by public officials? But if the source was one of the participants, not Barclays itself, why did that person sit on the recording for five years? One of the people in that conversation was jailed. This evidence could have exonerated him, and others. I think we need to know why this evidence was withheld for so long, and by whom. And we also need to know why it has now been revealed. Please don't tell me the old team had hidden it in a vault and the new team have only just found it. I don't believe it. There are serious questions for the Bank of England, too. Why did Paul Tucker deny knowing anything about lowballing, despite the existence of the file note implicating him? His involvement in this matter destroyed his chances of becoming Governor. Why did he sacrifice his career at the Bank? Who was he protecting - and why? I have previously asked why the FSA went ahead with fines and censure for Barclays and, subsequently, other banks when it appears they were acting at the behest of the Bank of England. The FSA must have seen the evidence Barclays presented to the Treasury Select Committee, though it may not have been aware of the recording. It therefore knew the Bank of England was possibly implicated. Hanging Barclays out to dry for an offence possibly committed at the behest of the Bank of England and the Treasury is hardly presenting a united front. Was the FSA distracting attention from its own failures by shafting other public institutions? There is another matter, too. Back in 2012, Joseph Cotterill reported that the Bank of England was also suspected of Libor manipulation prior to the financial crisis, between 2005-2007. This is an entirely different - and potentially much more serious - matter than attempting to cap Libor to prevent bank meltdown in the financial crisis. It suggests that the Bank may have been treating Libor as a shadow policy rate. There is some justification for this: if the main monetary policy rate and Libor become significantly decoupled, monetary policy loses traction. So it may be that the Bank leaned on panel banks to adjust their Libor submissions if Libor appeared to be becoming unanchored from the policy rate. But if this is what the Bank was doing, it didn't tell anyone. The Bank of England may or may not have had good reasons for manipulating Libor. But its officials had no reason whatsoever to conceal the Bank's actions. Lying to Parliament is totally unjustifiable - as is allowing people to be prosecuted, and serve jail time, for offences they may not have committed. The real disgrace is the web of lies that seems to have been woven by both Barclays and the Bank of England. We may never get to the bottom of this sorry mess. But we should give it a damn good try. Five years ago, I called for an independent judicial enquiry into the role of public institutions in Libor manipulation . I repeat that call now. Let those who really made the Libor decisions, both before and during the financial crisis, be brought to account. Well, yes to all that. Clearly and obviously. I'm surprised and disappointed that this story has not been across all newspapers and leading all news bulletins. That doesn't auger well for this story being pursued to the degree it should. This is very good! Thanks for making things clear....it would feel good to bring these people to account for a change. The audio from Dearlove to Johnson is merely consistent with Del Missier passing instruction down having misinterpreted Diamond. Panorama said the audio was provided just not admissible in court given the dates. The transcript concerning Tucker in 2007 and the Ricardo Master Fund are the more interesting and potentially damning revelations. What did Diamond have to gain from denying he took the call from Tucker as an instruction? Possible deflection from potential allegations of insider trading? Either everyone is innocent, or Tucker, Diamond et al sat in a room and hatched their story before facing parliament. Why Main Stream Media are not "all over" this is indeed illuminating. That the BofE may have wished to influence Libor to calm markets in 2008 may or may not be justifiable, but as you indicate earlier attempts may not. What is inescapable however is the possible miscarriage of justice - not only for the - perhaps wrongly imprisoned - traders but also for the far greater number bearing the burden of the subsequent austerity programme. It is still the same the whole world over ... its the poor that get the blame and the rich that get the money. Yes its all a crying shame! Some little people have gone to jail for rigging libor for profit. Did higher ups know what was going on? Probably. The Government got involved in rigging libor to stabilise the financial system. To do that senior bankers had to tell the troops to do it. No surprises here. You would expect it. It was the right thing to do at the time. Confidence is important. Before the GFC the banks were guilty of lending and borrowing money. Wait that's what they are supposed to do. The problem is to grow (for real stuff to get done) the economy is over reliant on private sector debt. The answer the Government needs to spend more. "Since banks invent money as fictitious deposits, it can be readily shown that capital adequacy based bank regulation does not have to restrict bank activity: banks can create money and hence can arrange for money to be made available to purchase newly issued shares that increase their bank capital. In other words, banks could simply invent the money that is then used to increase their capital. This is what Barclays Bank did in 2008, in order to avoid the use of tax money to shore up the bank's capital: Barclays ‘raised’ £5.8 bn in new equity from Gulf sovereign wealth investors — by, it has transpired, lending them the money! As is explained in Werner (2014a), Barclays implemented a standard loan operation, thus inventing the £5.8 bn deposit ‘lent’ to the investor. This deposit was then used to ‘purchase’ the newly issued Barclays shares. Thus in this case the bank liability originating from the bank loan to the Gulf investor transmuted from (1) an accounts payable liability to (2) a customer deposit liability, to finally end up as (3) equity — another category on the liability side of the bank's balance sheet. Effectively, Barclays invented its own capital. This certainly was cheaper for the UK tax payer than using tax money. As publicly listed companies in general are not allowed to lend money to firms for the purpose of buying their stocks, it was not in conformity with the Companies Act 2006 (Section 678, Prohibition of assistance for acquisition of shares in public company). But regulators were willing to overlook this. Postkey, I mentioned this Briefly in the post, though I did not go into details. The regulators were not willing to overlook it. They referred the deal to the Serious Fraud Office for investigation, who are due to give their findings in about a month's time. If the SFO conclude that the deal was fraudulent, there will be criminal prosecutions. That analysis overlooks the fact that the Bank now has a new asset, the debt from the new share holder. The capital is not fictitious as that debt is in the banks assets , it can be called upon. If we are going to be discussing criminality and prosecution with regard to Libor, then the obvious place to start is with Tom Hayes. Here's what I can find on the web for the judges comments. Can't seem to find the original summing up comments.